« Will the dying desk phone reinvent itself as a ‘multimedia device’? ORLANDO – Imagine using your headset not just for calls, but to adjust the temperature of your conference room or pull up documents you need for your meeting. With the advancement of next-generation wearable technology, those capabilities may not be so far off. Discussing the future of wearable technology at Enterprise Connect 2014, Plantronics CTO Joe Burton said next-generation wearable tech in the enterprise “can bend the Web to you” to perform those hypothetical capabilities. 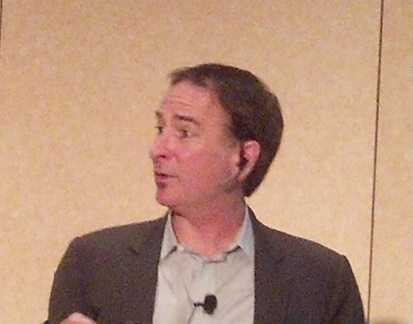 Plantronics CTO Joe Burton wears a headset during his presentation at Enterprise Connect. Current wearable technology shows the potential for next-generation products to go beyond simply taking voice calls. Intelligent headsets available from Plantronics already have capabilities that detect how near or far users are from their computers and allow users to seamlessly switch calls between mobile devices and their headsets, Burton said. “We can use a bunch of next-gen technology to begin restoring all of the fidelity of face-to-face interaction and apply that to many business workflows in a way that’s compelling,” he said. Burton said Plantronics’ focus is on evolving intelligent headset technology to solve relevant business issues for people, from the headset determining which conference room is free to the ability send contextual information, such as a user’s non-verbal cues, through a call. “What we have found is that for the most part, having multiple cooperative devices that do things well makes a ton of sense,” he said. He said devices like Samsung’s smartwatches and FitBit wristbands aren’t quite there yet in terms of giving users what they need in wearable technology.